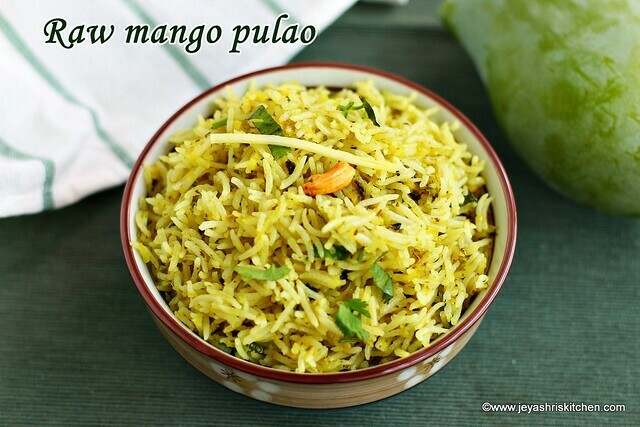 Raw mango pulao, a simple and easy pulao recipe made using raw mango, a perfect lunch box recipe. Mangoes are in season and i am posting recipe using ripe mangoes. Raw mangoes somehow we get so often in Singapore, as it is in season everywhere i wanted to post recipes using raw mango too. Generally we make South Indian version of raw mango rice, but this is a North Indian pulao recipe and it tasted so yum too. I just came across this name of Raw mango pulao in a restaurant menu very long back and just noted down the name. While going through that notebook, i was reminded of that and just tried it randomly and it was well received by every one at home. The crunchiness of the cashew nuts complimented the mango pulao and it paired well with Dabba style dal. 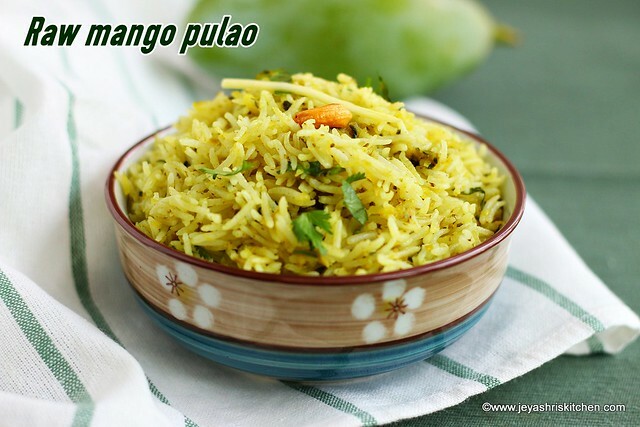 Raw mango pulao, a simple and easy pulao recipe made using raw mango, a perfect lunch box recipe. Wash the rice and cook in 1/2 cup of water for 3 whistles. Add salt and cardamom while cooking the rice. Discard the cardamom and spread the rice in a wide plate. Grind the mint, coriander, garlic, ginger and green chili into a paste. In a pan add the oil plus ghee and add in the cashew nuts. In the same oil add the ground paste and saute for 3-4 minutes in a medium flame. Add the grated raw mango now. Add turmeric powder, garam masala and salt. Ensure not to burn the mango mixture. Add the cooked rice now. Add the roasted cashew nuts. Raw mango pulao is ready to serve. Keep the raw mango grated. Cashew nuts gives nice crunchiness to the raw mango pulao. 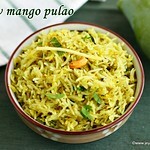 You can also add fresh green peas to the mango pulao.